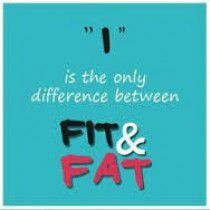 Are you Fat and Fit or Fat and Unfit? Does weight alone determine your health status, or can you live a long and healthy life even if you’re carrying some extra pounds? Recently Katie, a client called me angry, upset and discouraged. She had just returned from her yearly physical. Unfortunately, she didn’t reach her weight-loss goal; we helped her make lifestyle changes to improve her health. She had begun exercising consistently and made important changes to her nutritional habits, we even encouraged her to begin meditation to reduce stress. The results of her annual physical proved her efforts had been paying off.